Over the weekend following Halloween, Evan & I went on a 3-day backpacking adventure to Olympic Hot Springs. Elza has been keeping me busy over the summer, and this was the first backpacking trip I have been able to do this year. Normally, the springs are accessed via a short 2-mile hike from the Elwha River Road and are a popular destination. 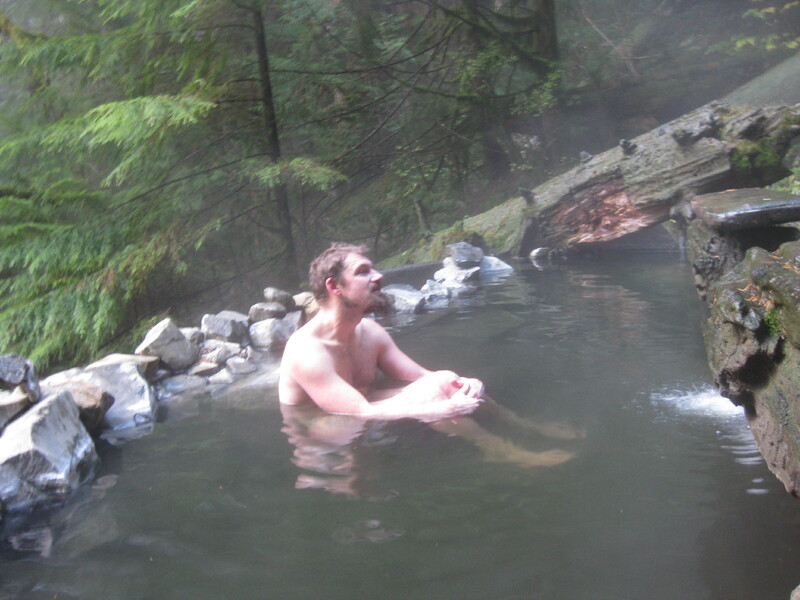 However, due to the Elwha Dam removal project, the hot springs have been much more difficult to reach over the past 3 or so years. 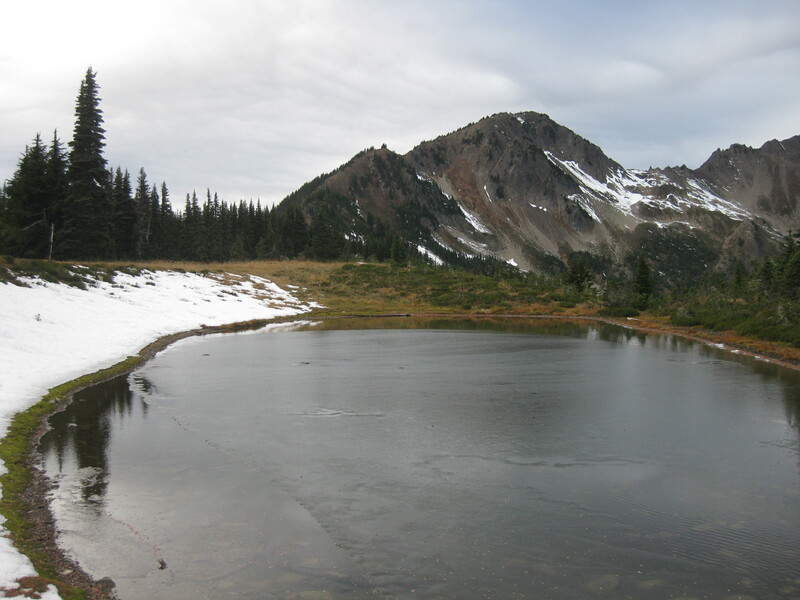 Currently, the only way to access the hot springs is to start in the Sol Duc Valley and hike about 13 miles over Appleton Pass. Due to the longer hike and the fact that it was November, we expected to see very few, if any, other folks at the springs. It was a unique opportunity to have the springs to ourselves and see them in a more natural state since having a greatly reduced number of visitors. On Thursday evening after work, I met Evan on the Bainbridge ferry and we drove to Port Angeles. There we had dinner with Evan’s friends (Bridgid & Casey) and spent the night at their house. 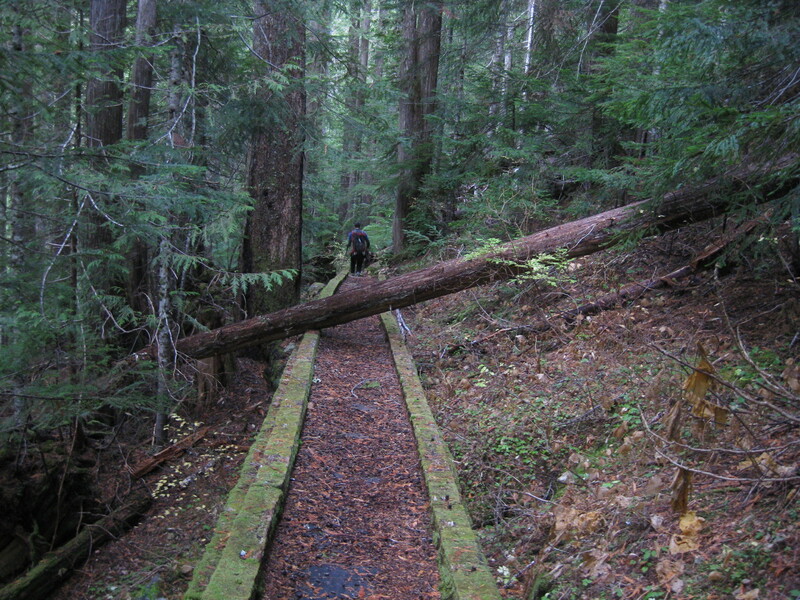 On Friday morning, we drove to the Sol Duc trailhead and started hiking up the valley, past the iconic Sol Duc Falls, and then up the Appleton Pass Trail, gaining about 3000′ elevation. We reached Appleton Pass around 2:30pm and ate lunch. There was just a little bit of snow up at the pass on Friday, but quite a bit more dumped during the storm on Saturday. 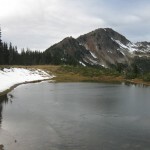 After lunch and exploring a little lake at the pass, we began the descent down the Boulder River drainage towards Olympic Hot Springs, losing the 3000′ that we had just gained. Along the way, we found an abundance of edible mushrooms, including Chanterelles, unusually large Hedgehogs, Hericium, and Sparassis crispa. We picked as much as we could reasonably eat in the next two days. We arrived at Boulder River camp (adjacent to the hot springs) just before it got dark. We quickly set up camp, ate a yummy dinner including wild mushrooms, and then went for a soak before turning in for the night. On Friday night, it started raining hard. A small pool formed under our tent and we and our stuff got a little wet. 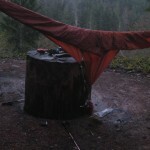 Thankfully we had set up a tarp over our cooking area the night before and we had a semi-dry place to hang out and make an oatmeal breakfast on Saturday morning. We were expecting the weather to be crummy today, but we didn’t have any plans other than soaking in the hot springs, and that’s what we did for almost the whole day. The springs have been receiving much less visitor traffic since the road closure, and some of the smaller springs have reverted to a more natural state, with colorful algae blooms and moss covering the rocks lining the pools. We soaked in two of the better/larger/deeper pools. As we soaked in the lovely warm water, the rain poured on our heads and we watched the wind whip through the valley, making us slightly concerned about trees falling. Due to the weather, we had little incentive to leave the springs and we spent almost the whole day soaking. My fingers and toes were reduced to prunes. Around 5:00, we decided that we should return to camp and start cooking dinner. 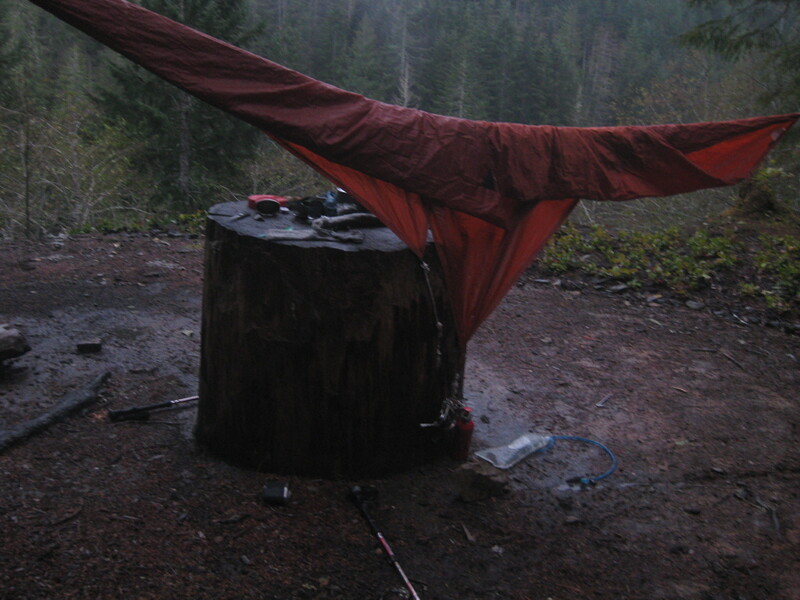 Upon returning to camp, we discovered that the wind had its way with our rain tarp, it was all twisted up and my stove has hopelessly tangled in the ropes. After about 20 minutes carefully extracting the stove from the ropes, we began cooking another yummy wild mushroom feast. Saturday night, the rain finally began to taper off. On Sunday morning we quickly broke camp and headed out as the clouds parted and the sun came out. 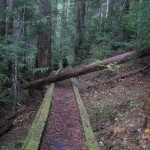 All-in-all, it was a highly successful trip despite stormy weather and an ambitious amount of hiking distance/elevation. The weather cooperated when we really needed it to, and we had the whole place to ourselves. I have been taking advantage of the recent nice weather over the past few weeks and I checked off two more Fitness Challenge activities. Now I only have four left to do. 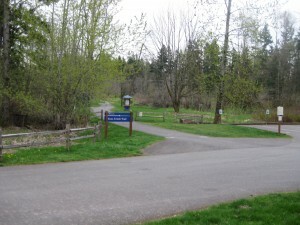 First was the Cedar River Trail. I loaded my bike onto a 143 bus after work and took it almost to Black Diamond, where the Green-to-Cedar Rivers Trail begins, which meets up with the Cedar River trail after a few miles. I cruised down the old railroad grade and picked up my secret code (snapped a photo of it without even stopping). It felt a little bit like cheating since I only had to ride the trail one way, when the challenge activity presumes a round trip. I made up for this by riding all the way home from Renton, and got home at dusk. Total trip was about 23 miles. 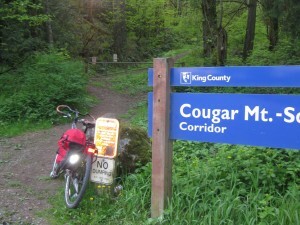 For the second activity, I went to the east side of Cougar Mountain. 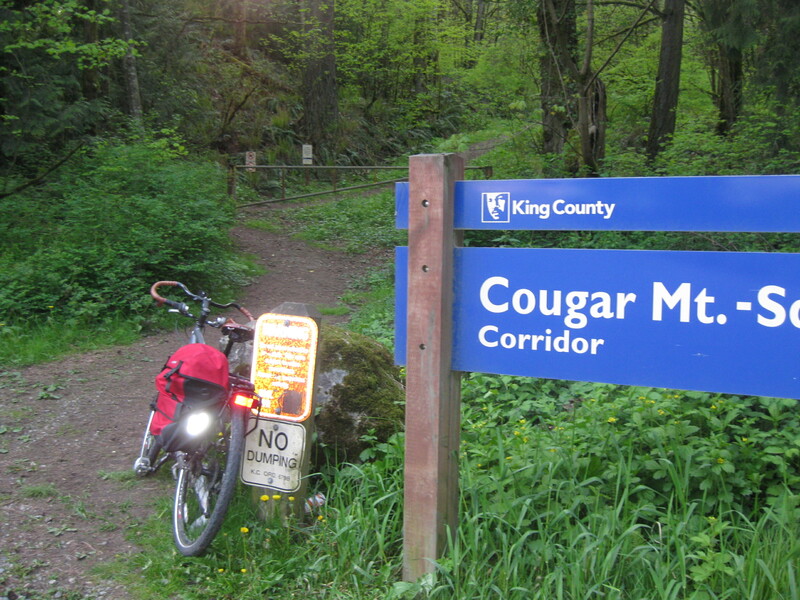 I took a Sound Transit Route 554 bus after work to the Issaquah Transit Center, and then rode about 3.5 miles up SR-900 to the Squak trailhead. From there it was about a 3 mile hike and about 1000′ of elevation gain to the top of Wilderness Peak. I chewed through that in about 45 minutes, reaching the top at about 7:40 PM. There wasn’t much up there at the top, not even a view, only a fancy bench, a logbook, and the all-important secret code word. 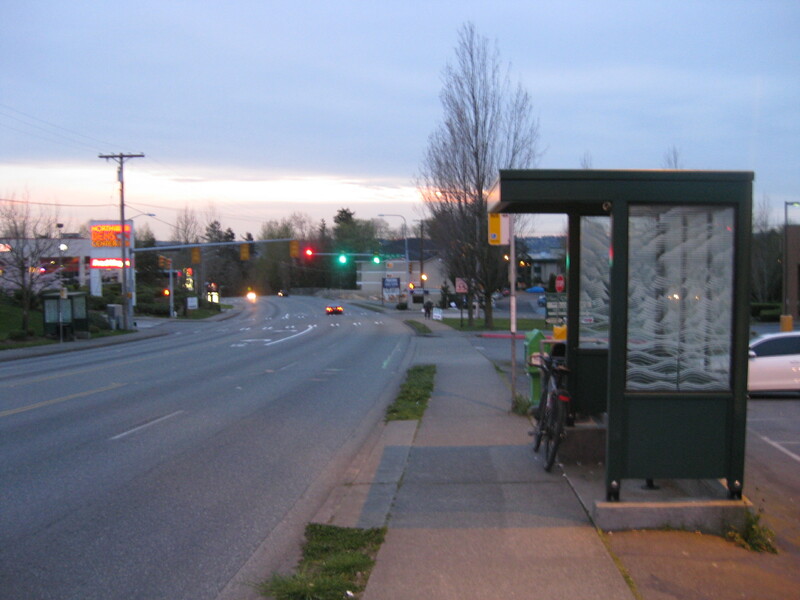 Then I turned around and did the same in reverse, making it back to the Issaquah Transit Center by 8:45 and home about 30 minutes after that. I have been enjoying these weekday evening jaunts into the foothills. The trails are not very crowded, I can get almost anywhere quickly via bus on a weekday evening from downtown, it gives me more flexibility to pick a day with nice weather, and best of all I don’t have to use up a weekend to complete these fitness challenge activities. Last weekend I participated in The Long Walk, at least part of it. The Long Walk was an event organized by 4 Culture that involved a bunch of people walking all the way from Golden Gardens to Snoqualmie Falls over the course of 4 days. 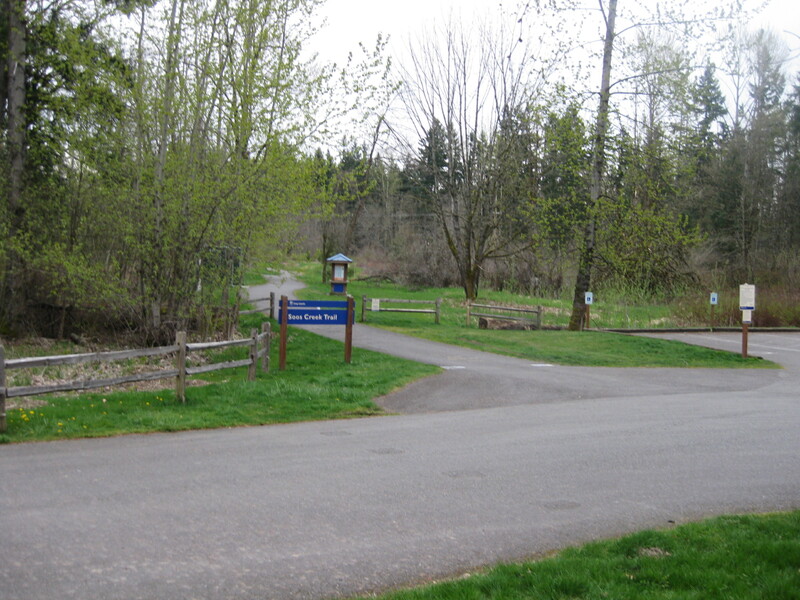 The route was basically the Burke Gilman trail to the Tolt Pipeline Trail, to the Snoqualmie Valley Trail. There were various art installations along the way that the walkers got to participate in. The Bicycle Choir was invited to sing at the Friday and Saturday night camp spots. This sounded interesting, so I joined Amie and headed out on Friday afternoon after work to where the group was camped in Duvall, near the old train depot. We hung our hammock in the woods and got fed veggie burgers by the organizers. The Bicycle Choir sang in a grassy field where one of the artists had woven some of the grass into braids! After that, a group called the Phonographers Union set up some microphones in the depot and invited us to “play the building,” using it to make sound in any way we wanted as long it didn’t do any permanent damage. A cacophony of floor stomping, beadboard being played like a washboard, and windows slamming shut ensued. This was fun. 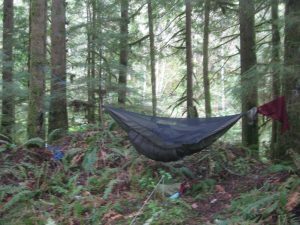 After that, we retreated to the hammock and slept well. 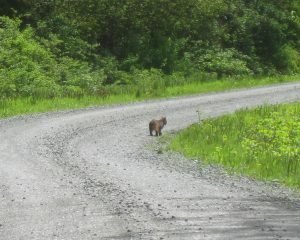 In the morning, a continental breakfast was provided, and then we were on the trail. 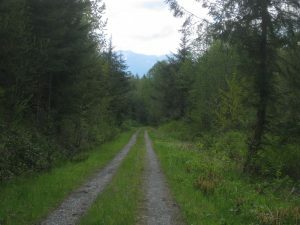 It was 9.5 miles to Carnation from here, all along an old railroad grade. We saw some interesting plants and chatted with some interesting people. The time flew by pretty fast and we were in Carnation in no time. We set up the hammock again in Told-MacDonald Park and went swimming at the confluence of the Tolt and Snoqualmie Rivers. That evening, in the nicely restored barn in the park, we all enjoyed an amazing Lebanese feast prepared and donated by the head chef of Sitka & Spruce. After that, Bicycle Choir sang again as the sun went down. After the party, Amie & I again retreated to the hammock. It began misting in the morning around 7am. We quickly stuffed our hammock and sleeping bag into the car, hung out in the barn a little while for breakfast, then headed home. The rest of the group continued on the hike to Snoqualmie Falls.